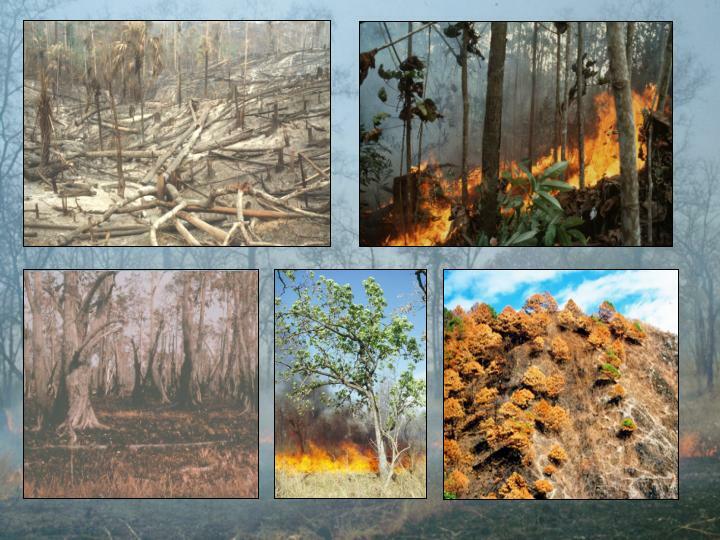 The main wildland fire problems in South East Asia are related to traditional shifting cultivation, land clearing fires, especially in converting native forests and peatland biomes to plantations, and uncontrolled wildfires in rainforests, peat-swamp forests, monsoon forests and mountain pine forests. High fire activities usually occur during dry spells and droughts caused by the El Niño-Southern Oscillation (ENSO) phenomenon. The reduction of transboundary smoke-haze pollution on human health and the environment are the driving reasons for regional cooperation with the Regional Wildland Fire Network and the ASEAN Agreement on Transboundary Haze Pollution. Photos used in composite: Anja A. Hoffmann and GFMC.